SMELLEZE Reusable Closet Smell Removal Deodorizer Pouch: Kills Clothing Odor Without Fragrances Treats 150 Sq. Ft.
SMELLEZE Reusable Closet Smell Removal Deodorizer Pouch: Kills Clothing Odor Without Fragrances Treats 150 Sq. Ft. Summary Smelleze® Reusable Closet Odor Removal Pouch gets rid of closet smell without masking with harmful fragrances. Closet odor doesn't stand a chance! Smelleze™ is reusable & lasts a year. Safe for people, pets & planet. This green smell removal deodorizer really works to remove clothes smell & clothes odor. Features & Benefits • Simply place in closet & smell the difference • Eliminates closet odors instead of covering them up • Can be easily regenerated & recycled • Environmentally friendly product • Creates a cleaner, healthier, safer, closet • Made in USA Keep Your Closet, Drawers, Trunks & Clothes Smelling Fresh Dark and damp closets with stagnant air often result in musty smells that build up on your costly clothing and can damage them. Other odors from shoes, perspiration and smoke can also be absorbed by your clothing making the problem worse and cause embarrassment. The Smelleze® Closet Odor Removal Pouch was specially developed to eliminate musty and stale closet odors on contact without masking them with fragrances. 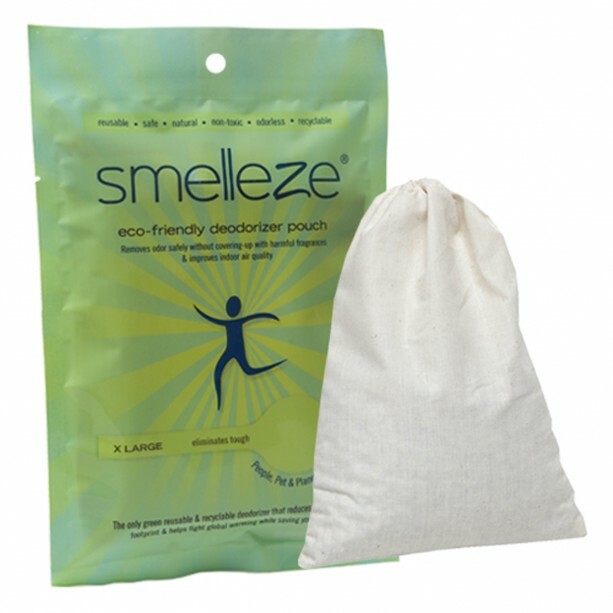 Smelleze® Closet Odor Remover Pouch will truly cleanse the air of offensive closet odors while preventing mold and mildew. 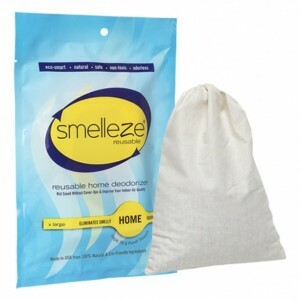 Using Smelleze® Closet Smell Removal Pouch will result in a fresh, clean smelling closet and clothing. This product is also effective at keeping leather articles smelling fresh and new. For a breath of fresh air, simply hang the reusable Smelleze® Closet Smell Control Pouch pouches in your closet and smell the difference. To rejuvenate periodically, simply heat in a microwave 2-4 minutes or place in direct sunlight for a day and reuse. Replace when rejuvenation does not help. Smelleze® Deodorizer Pouch can work for years so it is very cost effective. Smelleze® Closet Odor Control Pouch is non-toxic, safe, reusable recyclable, natural, odorless, non-flammable and non-caustic. 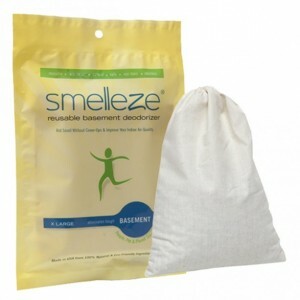 Smelleze® Closet Odor Eliminator Pouch is an ideal environmentally friendly solution for eliminating musty closet odors without adding pollutants to the air you breathe. It does not contain VOCs, harmful or ozone depleting chemicals and is especially beneficial for those suffering from allergies and chemical sensitivity. No fossil fuels are used in the production of Smelleze® smell eliminator deodorizer media.